Tobias Mayer was born on February 17, 1723 in Marbach a small town on the Neckar river a few miles from Stuttgart. His father was a cart-wright and an engineer who made water systems. When Mayer was young he plagued his mother with requests for paper and writing supplies to copy his father's water system plans. Mayer was orphaned when he was 8 and after a time in an orphanage he was taken on by a shoemaker named Gottlieb Kandler, from whom he learned geometry and architecture. Mayer attended the Latin school in Esslingen where he studied mathematics on his own and reached the top class in two years. He published a book on geometry when he was 18. He attempted to become a artillery officer but circumstances prevented him realizing this goal. He became an excellent map maker and in 1746 he joined the Homann Cartographic Bureau in Nuremberg. 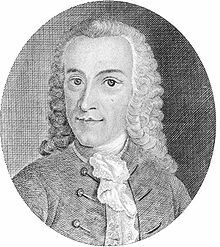 In 1751 he was appointed professor of mathematics and economy at the Georg August Academy in Gottingen. Mayer is mostly remembered for his astronomical observations of the moon. In 1748 and 1749 he made a map of the lunar surface and came to the conclusion that there was no atmosphere on the moon. At the time this was a controversial opinion. His lunar tables, published in 1752, were recommended by the British Astronomer Royal, for their utility in determining longitude while at sea. Mayer's widow received a 3000 pound grant from the British government after bringing them to England. A crater on the moon is named is named after him. He is often confused with his son, Johann Tobias Mayer, who was a physicist. Mayer died during the French occupation of Gottingen on February 20, 1762.